Free woodworking plans to build a custom closet organizer for wide reach-in closets. Can be customized to suit your needs and budget. 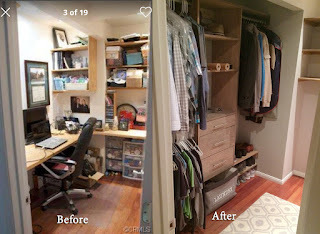 Over the years I've been redoing many of the closets in my home. The closets previously contained a single rod and shelf which didn't provide efficient use of space. These plans were inspired by the ClosetMaid Selectives 25 in. 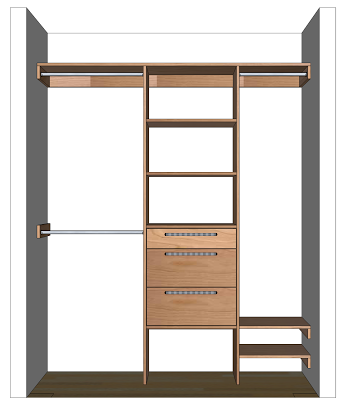 White Custom Closet Organizer which I have installed in a couple of closets. I was planning on making some modifications to the closets and wanted to see what I could come up with if I built everything myself. Depending on the plywood I used I could either save significant money and or come up with a more attractive and better quality closet organizer. Use these plans as a guide and customize the organizer to suit your needs. It should work well for reach-in closets 5' to 8' in length. You can modify the dimensions as you see fit. The main cabinet dimensions as planned is 84" height, 25-1/4" width and 15" depth. The plans show it installed in a 6' wide 2' deep closet. Depending on the size of your closet and any modifications you choose to make your cut list may be different. Depending on the size of your closet and any modifications to the plans you choose to make your cut plan may need to be different. . Cut the back shelf supports, top shelf and shoe shelves a little longer than necessary and trim them to size during installation. 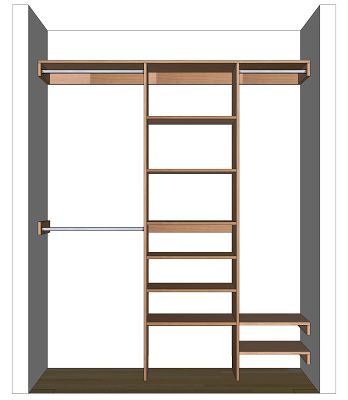 The main components of the closet organizer are constructed of 2 4' x 8' sheets of 3/4" plywood which will provide for a very strong closet system. 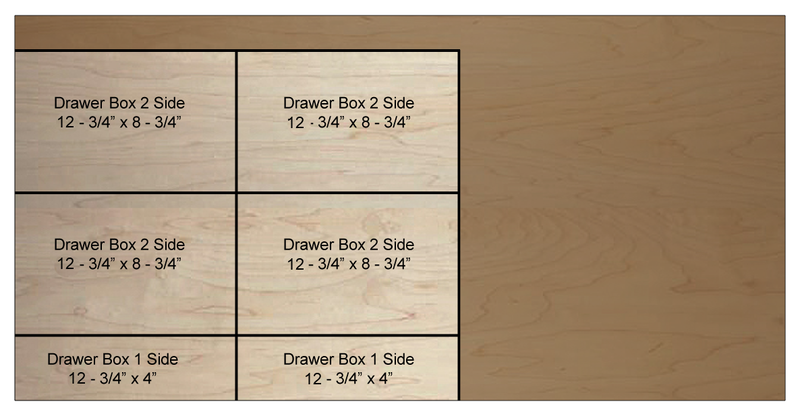 For the drawer bottoms you'll need 1 2' x 4' sheet of 1/4" plywood or tempered hardboard. You can choose to paint or stain/finish the plywood any way you'd like. If you're painting use low VOC primers and paints and if you're staining/finishing use water based stains and finishes to prevent your clothes from smelling. Oil based paints, stains and finishes tend to out gas for a long period of time and being in a confined space like a closet will concentrate the smell which will be absorbed in your clothing. After you cut out all the pieces paint or stain/finish the components before assembly. It will make the installation go a lot quicker. Before finishing read the entire plan to understand which edges should be edgebanded before finishing. Why Install A Closet Organizer? If you live in an older home, the closets may not be as big as you'd like which means it's important to get as much out of the space as possible. The single rod and shelf configuration that existed in my closets wasn't cutting it. One of my closets was 6' wide which meant I had 6' of rod space and 6 linear feet of shelf space. By installing a closet organizer I preserved my rod space but doubled my shelf space. It makes it easier to find what I'm looking for and helps keep my clothes from getting wrinkled when bunched close together. There are many different closet organizers you can buy. The ClosetMaid Selectives Organizer I've installed are pretty nice and not too expensive but you only get a basic closet organizer system. Adding accessories to make it more useful starts to bring up the price tag. Building my own will save some money. 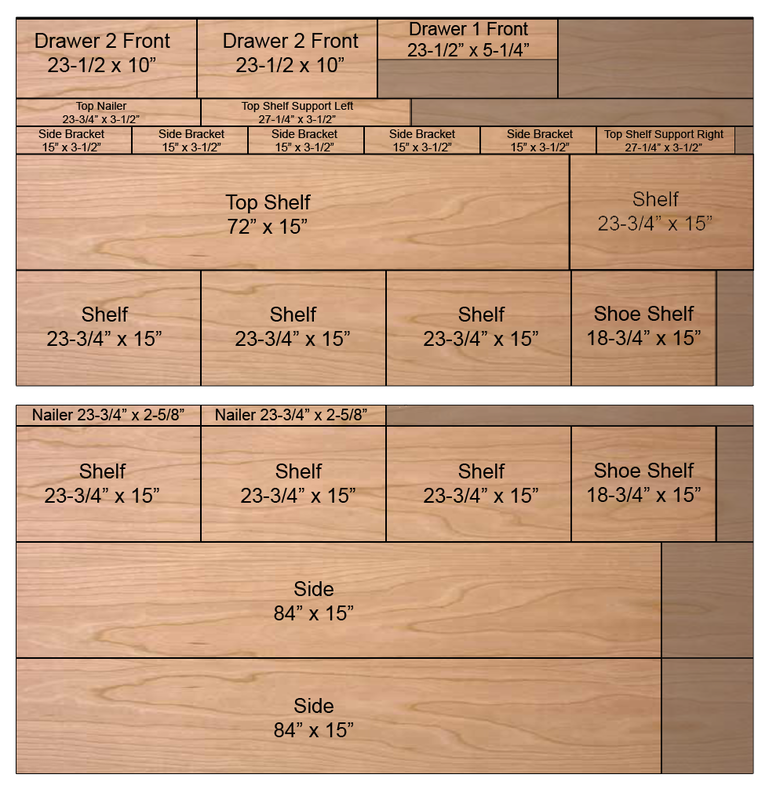 The ClosetMaid Selectives organizer is constructed of 5/8" melamine coated particle board and I have installed some 5/8" melamine coated Closet Maid shelves as well. In one closet I am storing some heavier items and even with a span of only 26" there is noticeable deflection (bending). 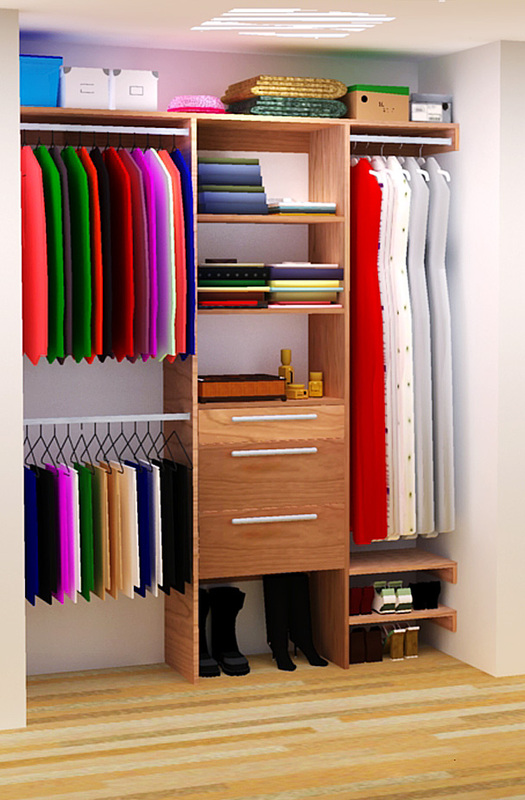 Building a closet organizer out of 3/4" sheet goods will make it sturdier and using something like PureBond hardwood veneer plywood can result in a more attractive closet that is also formaldehyde free. Of course being able to customize the closet organizer is also a very attractive reason for building one yourself. What Type Of Plywood To use? At a minimum I would recommend 5/8" thick sheet goods but 3/4" is preferred and usually easier to find. Hardwood veneered plywood is stronger and a more attractive option. Since most of the organizer will be covered with clothes you don't need to get the more expensive cabinet grade plywood. The domestic plywood available at Home Depot, such as PureBond is a good choice. If you like the scent of cedar on your clothes and the purported insect and mildew resisting properties you might want to consider making the organizer out of 3/4" aromatic cedar plywood if you can find it. 3/4" MDF (medium density fiberboard) is a little cheaper if you plan on painting it. Melamine coated particle board is also affordable and you don't have to worry about finishing the panels. Some people like the melamine coating because it's easy to keep clean and saves some time by not having to worry about painting or finishing. Particle board isn't as strong and durable as MDF or better yet plywood. In the end you should get what your taste and budget allows for. Edgebanding should be applied to the front edge of both Side pieces and the bottom of the top Nailer. You can edgeband the bottom of the other two nailers if you'd like but chances are you'll never see those edges. 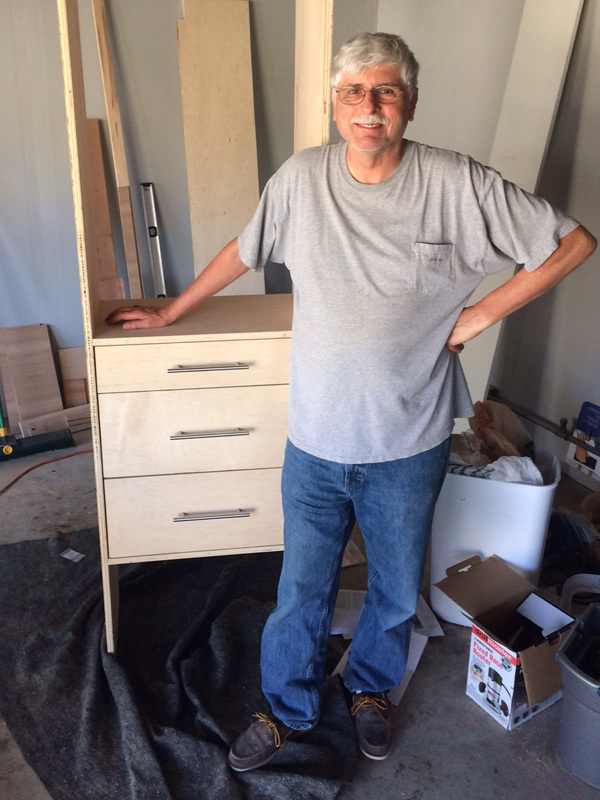 Having already cut and finished the plywood components it's time to start assembling the closet organizer cabinet. Lay one of the Side pieces on a flat work surface and attach the 3 nailers as shown using pocket holes and screws. The 3.5" nailer gets install flush with the top of the Side panel. The 2 2-5/8" nailers get installed at 14-3/4" and 41-1/4" from the bottom. The nailers provide support to the cabinet as well as a structure to secure it to the wall. You'll notice that a small notch is cut at the back/bottom of the side panel. This is to accommodate for the baseboard installed in the closet so that the organizer can sit flush against the back wall. The measurements for this cut will depend on the size of your baseboards. You don't have to be very precise and scribe the exact profile as this part will be hard to see. Install the 2 Fixed Shelves. 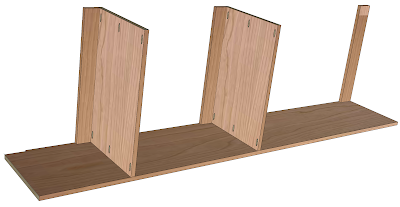 The fronts of the shelves should be edgebanded before finishing. These shelves help give the organizer strength. They are installed on top of the 2 thin nailers that were installed in the previous step. Use pocket holes and screws to secure the Fixed Shelves to the organizer Side piece. Now attach the other Side piece securing it to the Nailers and Fixed Shelves using pocket holes and screws. 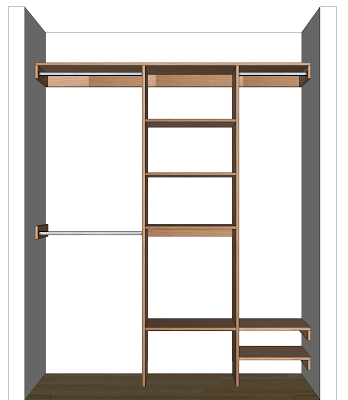 With the main cabinet frame of the closet organizer assembled you can begin to start installing your closet organizer. 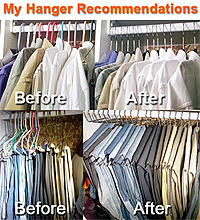 Position the organizer in your closet where you'd like it depending on how much double and single rod area you prefer. This organizer doesn't work that well with sliding closet doors because most people will want to install this close to the center which will be blocked by the doors. Installing bi-fold closet doors will give you more access into your closet but you might also be able to get away with installing the organizer more towards one side if you don't need a lot of long hanging area for example. Once you have the organizer positioned where you'd like make sure it's level and secure it to the wall by driving 3-1/2" wood screws through the nailers into the wall studs. The side brackets help support the shelves and provide a secure surface to attach the closet rods. 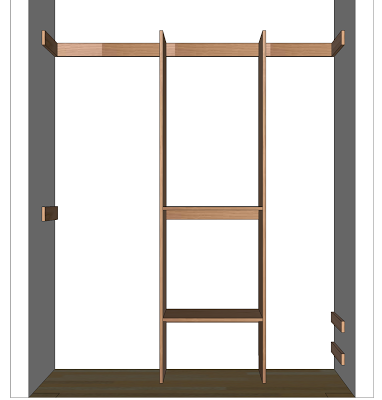 Attach the Side Brackets that support the closet rods and shelves to the side walls. The plan calls for these brackets to be 15" long. Before you cut them out check the stud locations on your walls to see if you might need to make them a little longer to be able to screw them securely into 2 studs. All the supports except one should be edge banded on the front and bottom. One of the supports which gets installed on the lower rod area of the double rod section (left in picture) should be edgebanded on three sides, top, bottom and front before finishing. The back of the supports should be up against the back wall of the closet. On the double rod side two supports are installed at 42" and 84" above the floor. On the single rod side three nailers are installed. One for the closet rod at 84" above the floor and two at 7" and 14-3/4" above the floor for the shoe rack. Make sure the supports are level and secure them into the studs using 3-1/2" wood screws. The Top Shelf Supports only need to be edgebanded along the bottom edge. You should have cut these out a few inches longer than your plan had called for. Measure and trim them to size and screw them into the studs on the back wall using 3-1/2" wood screws making sure they're level. Cut the closet rod into three pieces of appropriate length for your installation. You'll need a hacksaw for metal rods. I chose to design this closet organizer using chrome oval closet rods because I think the oval rods have a nicer appearance. The ClosetMaid organizer comes with adjustable closet rods which are convenient but because there are two pieces the rod is not smooth and hangers get hung up in the center. Custom cutting a rod to the exact size will eliminate that annoyance. Drill holes for the pins on the closet rod flanges onto the appropriate spots on the side supports and organizer sides and secure them with screws. On the side supports the flange should be installed so the top-center of the rod should be 1-1/2" below the top of the side support and 12" from the back wall (not the back support). On the cabinet side the flange should be installed so the top-center of the rod is 12" away from the back wall and 82-1/2" above the floor for the top rods and 40-1/2" above the floor for the lower rod. If everything else was installed accurately and level the rod should also be level but double check for level before screwing into the cabinet. Using a jig like the KREG Shelf Pin Drilling Jig drill holes for the adjustable shelf pins. Position the pins where you'd like and install the adjustable shelves. The shelves should be edgebanded on the front prior to finishing. With the adjustable shelves installed trim the top shelf to length and place it on top of the organizer. Secure the top shelf in place with 1-1/2" wood screws into the top of the organizer sides and the supports around the edge. This will help stabilize the organizer cabinet and prevent the shelf from moving. Pre-drill and countersink the screws to prevent them from snagging any items placed on the shelf. A combination pilot hole and counter-sink bit set like the DEWALT DW2535 3 Piece #6, #8, and #10 Countersink Assortment comes in handy. Attach the shelves for the shoe rack as shown, screwing from the top down into the side supports and using pocket hole screws to attach to the side of the cabinet. If you'd like to add more strength to these shelves if you anticipate people might try to stand on them to reach the top shelf for example, you can add additional bracing by installing a side bracket on the cabinet side. Drawers add convenience and a nicer appearance to the closet organizer but you can save a significant amount of money by omitting them and just installing more shelves. 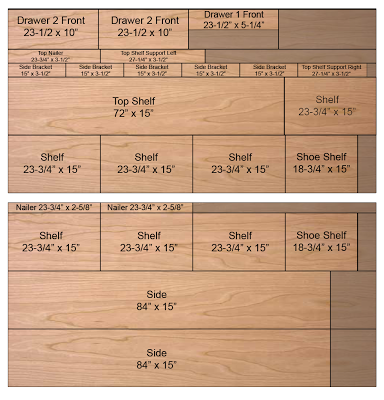 The cut plan accounts for extra shelves. One of the things I didn't like about the ClosetMaid Selectives closet organizer kit I purchased was that it didn't have a lot of shelves and necessitated purchasing either more shelves or drawers to make up for it which added to the cost. If you choose to omit the drawers you'll save money by not having to buy the additional 1/2" and 1/4" plywood for the drawer box construction as well as the drawer slides and drawer pulls. Instead you can add shelf pin holes and 2 adjustable shelves for added shoe storage. One of the biggest cost benefits however comes from building your own drawers. 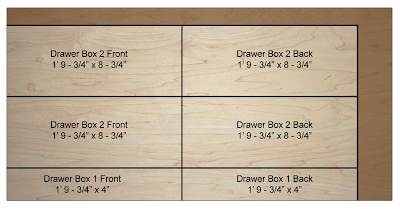 For what it costs to buy just one of ClosetMaid's drawer kits you can build all three drawers for our DIY closet organizer. There are 3 drawers in the plan. One 5-1/4" and two 10" drawers that get installed in the lower section of the closet organizer. You can choose any drawer pulls you'd like. The drawer fronts should be edgebanded on all 4 sides. For instructions on construction please see my article on http://littlebitjohnny.blogspot.com /2013/01/how-to-build-drawer-boxes.html">how to build drawer boxes. Once the drawers are installed this is what your finished organizer should look like. Eric Bahor used my closet organizer plans to convert his home office into a walk in closet. He built it with his dad and it came out looking great! What do you think? You have finished reading DIY Closet Organizer Plans For 5' to 8' Closet and many articles about Tech Gallery in our blog this, please read it. and url link of this article is https://littlebitjohnny.blogspot.com/2013/01/diy-closet-organizer-plans-for-5-to-8.html Hopefully discussion articles on provide more knowledge about the world of new tech gadgets.